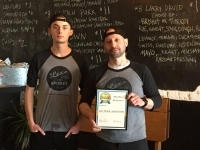 Anthony Zappola (right), owner of Lox, Stock and Brisket, 2019 Best New Restaurant or Bar winner, with employee E.J. Keating. In the 2019 Best of the Heights Awards contest, readers of the Heights Observer honored outstanding businesses in Cleveland Heights and University Heights by voting, Jan. 1 through Feb. 15, for their favorites in 12 categories. 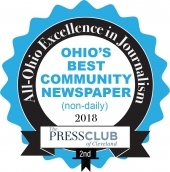 Lox, Stock and Brisket, a contemporary Jewish deli in University Heights, is the winner in the Best New Restaurant or Bar category, and PawsCLE, a doggy daycare and boarding facility in Cleveland Heights, is the winner in the Best New Business (other) category. Lox, Stock and Brisket, 13892 Cedar Road, is owned by Chef Anthony Zappola, a Cleveland native who returned to his hometown after starting a successful Asian fusion restaurant in Las Vegas. Zappola, who is of Italian heritage, is tickled that the restaurant has become so popular after only 10 months in business. “I didn’t expect it,” he said. “I thought perhaps we would attract the hipsters, but I’m thrilled that the locals like us so much.” The restaurant, which is closed Mondays, is open for breakfast and lunch, serving Jewish deli favorites with a contemporary twist. Best New Business (other) category winner PawsCLE, 1970 Lee Road, is owned by Jeff Bradish, a University Heights resident who decided to become an entrepreneur after a career in medical sales. He and his wife, Meghan, purchased the former Rite Aid building and renovated it to offer wide-open indoor and outdoor spaces in which dogs can stretch their legs, play, and relax. Their goldendoodle, Frank, is the company mascot and often is on site to greet customers at the clean, modern facility and help clients, and their owners, feel comfortable and safe. Last year, there was only one Best New Business category, and Boss Dog Brewing Company, 2179 Lee Road, was the winner. This year, it was a finalist in the Best New Restaurant or Bar category. The other finalist was Fishstix, a kosher seafood store located at 14480 Cedar Road. Owned by Brooklyn, N.Y. native Leo Gluck, Fishstix opened about a year ago and quickly attracted a loyal following. The store offers take-out raw and cooked seafood, sandwiches and other sides—all certified kosher by Cleveland Kosher. The store is open Sunday through Friday (closing three hours before sundown on Fridays). The 2019 finalists for the Best New Business (other) category were Studio How-To and Stems Fleur. Studio How-To, 1799 Coventry Road, is owned by Sarah Nemecek, who moved her business from Lee Road about a year ago. The shop offers lessons in how to create traditional handcrafted items with a modern twist. In addition to a selection of high-quality and designer yarns, cotton fabrics, tools, and handcrafting kits, the shop offers creative workshops to help customers learn how to sew, knit, work with leather, macramé, weave, embroider, and more. Nemecek said she is pleased with Coventry Village's welcoming environment, and the amount of foot traffic in the district. Stems Fleur, 2495 Lee Blvd., moved from the basement of owner Scott Robertson’s Shaker Heights home to the Heights Rockefeller Building about six months ago. “I had flowers everywhere in my house,” said Robertson. “Then my friend Shawn Paul [who owns Shawn Paul Salon next door] told me about the space here and I knew it was time to move.” The shop and studio offers ready-made flower arrangements, plants and gifts, creates custom arrangements, and services smaller weddings and events. For the second year in a row, Marotta’s, 2289 Lee Road, was voted Best Place to Work. It was also voted Best Exterior Style. Currently closed for renovations, the intimate space offers pizza and Italian specialties, along with an extensive, all-Italian wine list. Owner Brian Linihan has continued to operate the well-loved business after the untimely death of his wife, Alicia Marotta Linihan, in 2016. Finalists for Best Place to Work were Heights Libraries and Quintana’s Barber & Dream Spa. Just up the road and across the street, S’Wonderful Gifts, 2254 Lee Road, won Best Place to Find Unique Gifts. Since 2015, owner Bill Wort has offered a distinctive assortment of gift items, including jewelry, plush animals, ceramics, watches, purses, soaps and greeting cards. Finalists for this category were Heights Arts and In the 216. CLE Urban Winery owner Destiny Burns was thrilled to win Best Heights Vibe and Best Cleveland Heights Business. The winery and tasting room is located in two side-by-side storefronts at 2908 and 2180 Lee Road. Wines are crafted and bottled on site from premium juices sourced primarily from the West Coast, and customers can attend wine tastings and special events in the chic and comfortable space. Burns’ steadfast support of local causes and participation in civic events have made her a Heights Observer reader favorite. Finalists for the Best Heights Vibe category were The Wine Spot and Tommy’s. Finalists in the Best Cleveland Heights Business category were Quintana’s Barber & Dream Spa, 2200 S. Taylor Road, and Sits ‘n Wiggles, a home-based pet sitting and training business. Quintana’s, which has won many “Best of” awards over the years, is owned by Dawn and Alex Quintana. One unique feature of the day spa and barber shop is a secret speakeasy that serves classic craft cocktails. Sits ‘n Wiggles owners Valerie Ross and Hannah Smith have grown their Noble neighborhood-based business to six employees and more than 200 customers in less than four years. They say the diversity of the area and its proximity to cool shops is what drew them to the Heights. Tommy’s, 1824 Coventry Road, is still the Best Place to Take an Out-of-Towner (an award it shared last year with Nighttown). What started as a small soda fountain in 1972 is now a Coventry Village icon, where owner Tommy Fello offers a wide variety of vegan, vegetarian and meat entrees, and the best milkshakes around. Finalists for this category were CLE Urban Winery and Marotta’s. For the third year in a row, Gigi’s on Fairmount, 3477 Fairmount Blvd., has won for Best Interior Style. It also took the honors for a new category this year, Best Customer Bathroom, and was a finalist for Best Exterior Style. Apparently, Heights Observer readers have a soft spot for the chic, intimate bar and restaurant, with its extensive outdoor patio and elegantly appointed bathroom. The attention to detail in the décor is as much an asset of this local business as its unique menu and hand-crafted cocktails. The style of CLE Urban Winery, Marotta’s, and Boss Dog Brewing Company also gained attention, as these businesses were contenders in these categories. Barrio, 2466 Fairmount Blvd., continues its reign as Best Bang for Your Buck, an honor it received in 2018 as well. This purveyor of custom tacos, tequila and whiskey has provided Heights residents with cheap and delicious eats. Now with five locations in the region, the Heights location has been a big draw since it opened in early 2017. Just across the street is Aladdin’s Eatery, which was a finalist in this category. The award for Best University Heights Business went to Fairmount Cleaners, which has been offering dry-cleaning services since 1927. Originally located in the Cedar Fairmount Business District, the business now makes its home at 2163 South Taylor Road in University Heights. 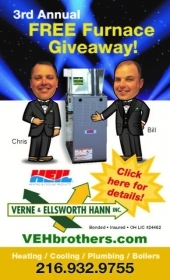 Steve and Adam Grace, the third- and fourth-generation owners, are proud that their friendly and knowledgeable staff provides excellent customer service. Finalists for this category were Lox, Stock and Brisket and Bialy’s Bagels, 2267 Warrensville Center Road, where new owners Rachel and Sarah Gross are continuing the tradition of this Eastside institution. 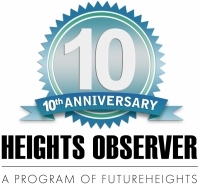 Since 2005, FutureHeights—a nonprofit that inspires and facilitates collaboration and empowerment in our community—has conducted the Best of the Heights awards to recognize the unique attributes of locally owned Heights businesses, and their contributions to the local economy. A complete list of 2019 Best of the Heights winners and finalists, as well as a list of businesses that voters said they would like to see in the Heights, is online at www.futureheights.org.